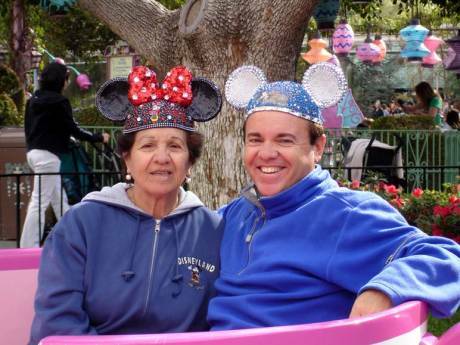 As Mother’s Day approaches each year, I think of my mom and the incredible woman she was — full of love to give, a true commitment to family, and a great sense of humor. I couldn’t have been luckier to have been raised by such a strong, smart, hard-working role model. And I’m proud to have been there when my mom needed me most. For the last 10 years of her life, I was my mom’s family caregiver. I saw her and my pop through numerous surgeries, falls, cancer — through life transitions, and more. I navigated hospitals, managed medications, cleaned wounds and helped with anything else they needed to stay safely in their home. My story is far from unique. Today, 40 million Americans care for moms, dads, spouses, adult children and other loved ones so they can live independently at home — where they want to be. As we near Mother’s Day, I want to take a moment and highlight two fellow family caregivers who shared their stories on I Heart Caregivers, AARP’s storytelling initiative. Claudio and Corrie both care for their moms. Claudio has been helping his now 83-year-old mother, Natalina, for the last 24 years — nearly half his life. I would not change one thing and have never any regret and so glad I made that choice, she has enriched not only my life but the lives of many … I think I am the luckiest 52-year-old around. Corrie cares for her mother, Carolyn, who has Alzheimer’s and a seizure disorder. After losing her job because of taking time off to manage Carolyn’s needs, Corrie became her mom’s full-time caregiver — handling responsibilities 24/7. She took ill around December of 2014 and her doctors informed us that my mom could no longer live by herself due to dementia, Alzheimer’s, and a seizure disorder which the seizures were brought on by her neurological condition… I ended getting written up from my job because of my attendance because of me caring for my mom… I was then terminated from my job that I had been at for years. Right now I am a proud full-time caregiver for my mom. It’s the only job I’ve ever felt so privileged to have … this is a no-brainer for me and I wouldn’t change a thing. Workplace flexibility, so family caregivers like Corrie don’t have to face losing paychecks or even their jobs because they’re caring for a loved one. This year already Vermont and New York have passed legislation to help family caregivers juggle work and caregiving. Respite so family caregivers like Claudio can take a hard-earned break. Just last month Wisconsin increased the number of family caregivers who will have access to this type of relief. Help at home, training, financial protection and more. To all the moms who cared for us, and all the moms for whom we now care, happy Mother’s Day. Do you care for your mom or another loved one? Share your story and help us fight for family caregivers.